Forest, open woodland, gardens, and cultivated areas all constitute bulbul habitat. Essentially arboreal birds, the majority of pycnonotids live in or next to forested areas, but many are well adapted to human-made habitats. Many bulbuls show a preference for a particular level of the forest canopy. So as long as there is enough fruit and insects, a relatively small area of forest may support a large number of birds. 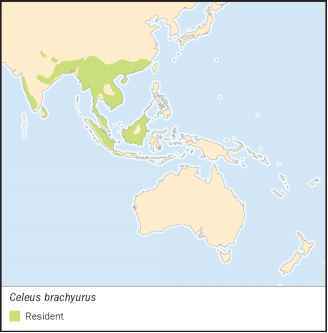 The majority of Andropadus species keep to the forest interior, as do many others, such as Finsch's bulbul (Criniger finschii) of Indonesia, and the African gray-headed greenbul (Phyllastrephus poliocephalus). Other species prefer more open areas and are found frequently in edge habitat. The gray-headed bristlebill (Bleda canicapilla) and the white-throated greenbul (Phyllastrephus albigularis), both found exclusively in western north-central Africa, are typically found at forest clearings and edges where there is tangled vegetation in which they can forage for insects. Pycnonotus species are well adapted to drier habitats, and are frequently found in areas that have been cultivated by humans. A few are confined to the forest, but they generally inhabit open country with scattered trees and shrubs. The yellow-throated leaf-love (Chlorocichla flavi-collis) actually avoids large forest blocks, occurring mainly in brushy, more open areas. This bird also adapts extremely well to man-made habitats; and can be found in plantations, abandoned cultivated sites, orchards, parks, and gardens. Several bulbuls show a preference for water and are found alongside rivers and forest streams. The gray-olive bulbul (Phyllastrephus cerviniventris) is one such bird. Infrequently entering the forest, this smallish bulbul frequently inhabits streamside thickets. Primarily an insect eater in Zambia, it is especially fond of feeding on logs that have fallen across streams or ravines. The swamp greenbul (Thescelocichla leu-copleura) and the leaf-love (Pyrrhurus scandens) are also partial to water, both prefer swampy areas with luxuriant vegetation and palm trees, especially Raphia and the oil palm Elaeis. 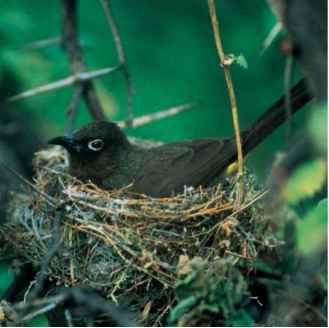 Although most bulbuls prefer areas with lots of green vegetation, a small number are found in drier scrub habitats, especially Pycnonotus. The African red-eyed bulbul (Pycnonotus nigricans) occupies drier areas, including savanna, semiarid scrub, and bushy hillsides. The northern brownbul (Phyllas-trephus strepitans) also prefers scrub, and is often the only bul-bul present in the driest parts of its range.